Ten of Wands says you have been under pressure and experienced many changes in your lifetime. Your creativity has been blocked because you have taken on too many responsibilities. You are experiencing an oppressive burden both physically and mentally. Dynamic change will “seem” impossible when you are burdened by too great a load or too many activities. When you take on other people’s cares and projects – you are unable to take time for yourself. Your vision becomes blocked by the immediate concerns of day-to-day drudgeries. Reconsider the tremendous responsibilities you have taken on. Do you actually prefer life this way or are you purposely holding yourself back? Has your eagerness to please others involved you in so many situations that your energy is weighed down with commitments and problems? Do you want to be free to travel, to seek adventure and new involvements – yet find yourself caught in an endless circle of responsibilities – family, financial and work? Do you take on all the total weight of your relationships – always trying to smooth whatever problems, conflicts or dissatisfactions arise – actually struggling to keep a relationship going while the other person is not even aware of what is happening? You have created these situations yourself – by acting without thinking or taking on a new problem simply for the challenge. In practical or emotional affairs – other approaches are possible – recognize now that these burdens can be avoided. Consider now if your burdens are real or if they are serving as an excuse to avoid doing something really constructive with your life – such as allowing yourself to break away from a bad situation? Begin to stretch the limits and boundaries you have placed on yourself – extend yourself. Confront your fear of success and begin to move forward and grow. Experience the unfamiliar and grow in understanding. See with greater clarity your subconscious fears, your intuitive wisdom and your personal power. Teach yourself to be at home anywhere; to be versatile, adaptable and flexible. The completion of a major spiritual cycle, with outcomes as God would have them. The ultimate extension of the self in the Spiritual Plane. The merging of God within (self-will/man’s will) with the god without (God’s will). Hard work and so correctly communicates the paradox of spiritual fulfillment as more work, more responsibility – not less. Our path leads ever to more work, but we are ever more capable of handling it. Things get both harder and easier. Duality – the completion of one cycle is merely the preparation for the next even greater task. A knowing relationship with the Divine, a hands-on working knowledge of the endless cycle of underlying ultimate truths. The soul in control – a spiritual master in the making. Not only do we have the wisdom which is the ability to manage knowledge, here is the Wisdom which is the ability to manage spirit. Spiritual longevity, individual spirit identified with universal spirit – a dedicated life to whom much is given and much is required. Wisdom. What responsibilities are weighing heavily on your shoulders? What are you feeling burdened with? Who or what is restricting you and keeping you from manifesting your full radiant energy? Why have you taken on these responsibilities? How can you best use your powers and energies? Next to Fool: You have miscalculated or misjudged a situation, reconsider every aspect and correct. Pentacles and Cups on all sides: Prosperity and growth of the right kind in business. Next to Star: Ventures will be successful – it will happen soon. Followed by Nine of Swords: Success can be stopped – prepare your mind for any opposition that can arise. In the first position: Much of your energy in this incarnation will be lent to others, to help them with their lessons. To do this, you will be side by side with them experiencing the same thoughts, the same feelings, but with your understanding you will lend that extra advantage to help them along. This is to be an arm of God’s grace. In the second position: To others, your resources may seem as magic for what you need is always at hand when you need it. It may not, however, be there the day before. For this path never asks for more than it needs, allowing the world resources to be allocated when and where the need is greatest. It has no need for stockpiling against the advent of disaster. In the third position: This is the work for which you were born. Accomplish well what is on your table now and more will be given you, and more, and more and more. In the fourth position: The passion here at such a young age is hard to imagine for it is so filled with spiritual fervor – a depth of love that usually requires years of study and experience – but the love of God which strikes every mortal heart every second of every day can be returned by any of us, even at such an early stage. This passion is purely and simply love of the spirit that infills man – love of God. In the fifth position: You are aware of the importance of this time and of what you are doing. It is both difficult and yet easy, for it is right and it feels right. In the sixth position: In the near future as your heart commits to higher goals, there will be adjustments for you and those nearest you. In the seventh position: This next year your mind will grow by leaps and bounds as you learn your lessons at a dizzying pace. But your appetite will be for no more than you can handle well. You will feel the in-surge of power. In the eighth position: If everything seems to be happening at once, that’s because it is. It may be a very simple event in itself, involving just yourself or you and a few close to you, but there may be far – reaching implications. But, it also may be a truly grand affair, creating quite a stir for others as well as yourself. You may be very instrumental in bringing this event of consequence about. 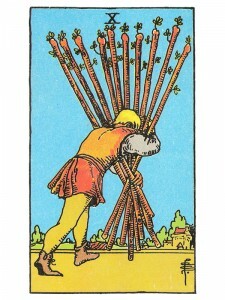 In the ninth position: Here is energy and motivation of the highest order for the worthwhile purposes at hand. In the tenth position: You can safely accept greater responsibility for your willingness and ability to learn has made you much stronger.